Based in Tyrrellspass, Green Fingers Landscaping, Maintenance & Design provide our extensive range of gardening services to both domestic and commercial clients throughout Westmeath, Offaly and surrounding counties. 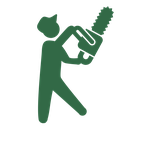 We are fully registered and insured to complete all types of garden work, from soft and hard landscaping jobs to garden maintenance and light tree service work. All our services are offered at competitive prices, without compromising on quality. For your convenience, we offer comprehensive advice as well as a free, no-obligation quote before any work begins. 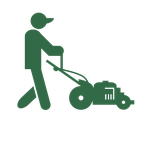 Green Fingers Landscaping, Maintenance & Design is owned and operated by Simon Parker – a fully qualified greenkeeper who has over a decade of experience and knowledge. Simon previously worked on the construction, maintenance, and remodelling of golf courses, until in 2015 he decided to use his expertise to grow his own business. Simon is extremely dedicated to his work which is evident in the high standard to which each project is completed. For images of projects we have completed, please view our gallery. At Green Fingers Landscaping, Maintenance & Design we offer comprehensive soft and hard landscaping services, no job is too big or too small. We work closely with you, combining our extensive knowledge and experience with your design directions in order to create a finished product you are happy with. Contact us if you wish to discuss your landscaping requirements, we are always happy to provide sound, practical advice. We are specialists in garden maintenance, providing an extensive range of services aimed at keeping your garden looking fresh and beautiful. A busy lifestyle can leave you without the time to properly tend to your garden, let Green Fingers Landscaping, Maintenance & Design take care of it – we cover all aspects to ensure your garden is completely restored. If you have any queries or would like to discuss the full range of services available from Green Fingers Landscaping, Maintenance & Design why not give us a call on 0449310818 or, alternatively you can send us an email using info@greenfingerslandscaping.ie. We are always happy to offer sound, practical advice.